Natour lab, supported by the Municipality of Sfakia and the Management Body of Samaria National Park, organize the second vertical run race - Sfakia Vertical Run. 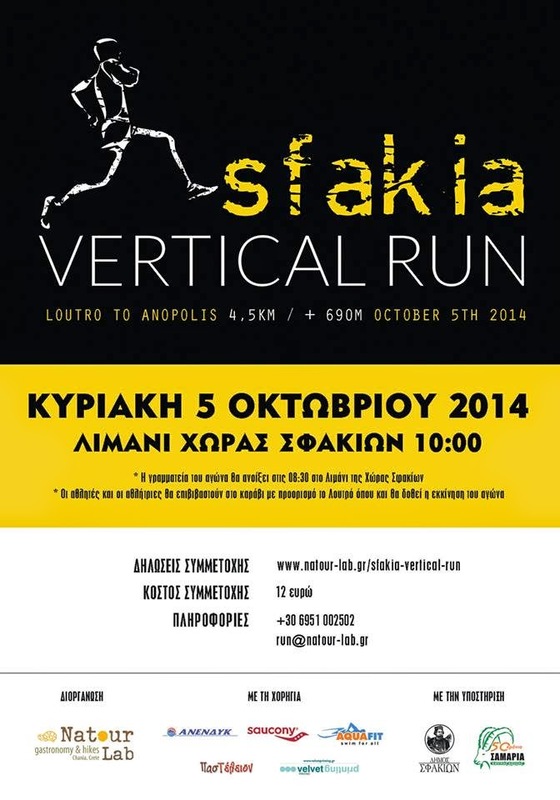 The race will take place on the 5th of October 2014, and will cover the distance from Loutro to Anopoli Sfakion. It is a dynamic race of strength and endurance since you get 690 metres of altitude in just 4.5km. The start of the race will be given inside the ferry boat to Loutro, with the lowering of the rear ramp, in queues. After that, the athletes will run parallel to the shoreline of Loutro and will continue running on the steep rocky trail towards the chapel of St. Catherine at 687m. There, the athletes will have to validate their presence by ringing the chapel bell and then head down towards the finishing line at the village square of Anopolis.